Once upon a time, policy discussions in Washington, D.C. reflected an understanding that achieving border security required more potent combinations of border agents, advanced technologies, and physical barriers. The demand of President Donald J. Trump for funding to build a wall along the border between the United States and Mexico jettisons this bipartisan approach and rejects arguments that better border security requires technology more than additional physical barriers. 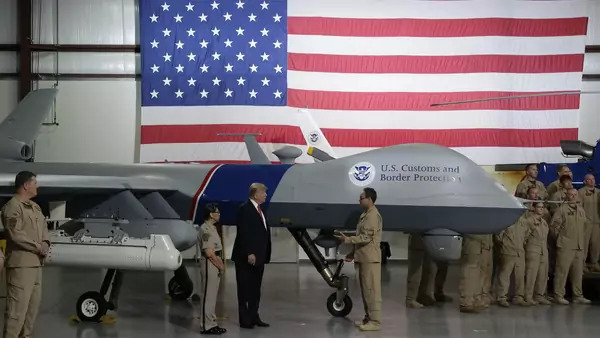 The president is aware of the technological tools used for border security purposes, but he apparently believes that technology, even combined with more border patrol agents, has reached the limits of its contribution to border security. Is the president right? As in every policy area, governments all over the world have worked to integrate advanced, digital technologies into border security efforts. The suite of technologies deployed for this purpose include drones, powerful cameras, various detection devices and sensors, mobile communications, satellite imagery, biometrics, big-data analytics, and artificial intelligence. The information produced by these and other types of technologies allow border security officials and personnel to knit data together in order to provide heightened situational awareness of border activities that facilitates both tactical action and strategic adjustment. Better situational awareness provides border security with the flexibility to tailor deployment of personnel, technology, and physical barriers in accordance with key factors, including topography, climate, demographics, and patterns of migration and criminal activities. a “Southern Border Fencing Strategy” to identify where fencing, infrastructure, and technology should be deployed along the southern border. This bill faltered in the House of Representatives because of its provisions addressing illegal immigrants already in the United States, not because of disagreement on the need for networking agents, technology, and physical barriers at the border. The need to integrate people and technology with barriers in defending territory is, of course, as old as walls themselves. Walls—be they ancient, medieval, or modern—have always been strategic or tactical amalgamations of guards, the latest technologies, and physical materials. The wall debate has people scoffing at medieval wall-builders as if they were characters in Monty Python and the Holy Grail. But, in their time, defensive walls were products of social organization, exploitation of cutting-edge technologies, and feats of engineering skill. The president’s obsession that only more concrete slabs or steel slats can better secure the U.S. southern border fundamentally misunderstands what walls have always been. This failure goes deeper than his inability to accept the evidence that no security or humanitarian crisis exists along the border with Mexico. Worse, the wall debate is preventing policymakers from deliberating effectively on how to re-calibrate the utilization of personnel, technology, and physical barriers for improved border security. Where does information from enhanced situational awareness at the border converge with other data to support adding additional barriers or removing existing ones? The course on which the president insists will, if taken, make border patrol agents and advanced technologies subservient to the physical barrier, rather than having agents, technologies, and barriers configured, networked, and deployed in the most effective ways to serve the various national interests and ideals touched by border security.